And not only did their guests oblige them, but some went the extra mile: Toni’s mum came as the evil Cruella de Vil from 101 Dalmations. 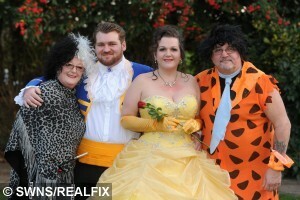 Her dad, came as Fred Flintstone, and among the guests were a Minion, Sleeping Beauty, Woody from Toy Story, Cinderella, Elsie from frozen, Mary Poppins, and even a Joker from Batman. The most surprising part of this fairy-tale though, is that the Beauty and the Beast idea was actually Eric’s. They agreed that neither wanted a traditional wedding, but deciding how to proceed with such short notice was quite tricky. 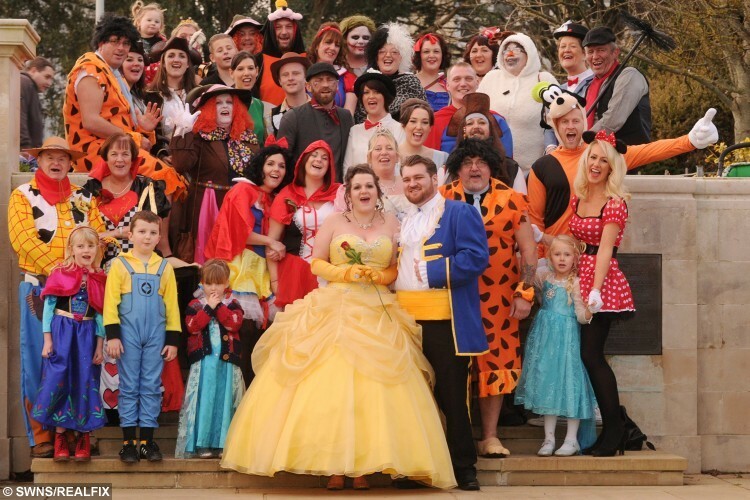 And so the stage was set – a cartoon, Disney-themed wedding it was to be. Delighted Toni picked out Belle’s canary yellow diamante-studded frock and evening gloves, and set about informing her friends and family of the unorthodox dress-code. Toni says: ‘I’ve never really dreamed of a big white dress, I wanted it to be laid back and relaxed and I wanted everyone to have fun. ‘I love dressing up, I always have and I’ve always been a fan of Disney, me and my sister used to watch it together and sing all the songs. 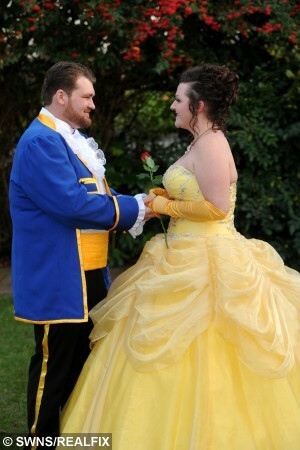 ‘I only chose to go as Belle because my husband wanted to be the Beast, as he’s a big and hairy Australian. Those invited were met with the famous song from the film, Be My Guest, and the couple walked down the aisle to A Tale as Old as Time. A white cake with a single red rose under a crystal vase topper finished off the Beauty and the Beast theme.